They collect statistical data about your browsing actions and patterns and DO NOT identify you as an individual. 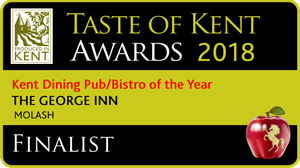 What cookies does The George Restaurant & Bar website use? This site only uses Strictly Necessary Cookies that the website needs to function. They only last for the duration of the session (whilst you are on our website).